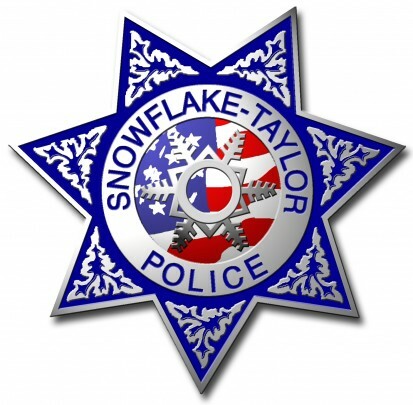 With the pending retirement of the current Chief, the Town of Snowflake is recruiting applicants for the position of Chief of Police of the Snowflake-Taylor Police Department. Located near Arizona’s White Mountains, the Towns of Snowflake and Taylor are home to approximately 11,000 residents. The Town is seeking an accomplished professional who is inspiring, visionary and experienced in all aspects of police operations; including patrol, criminal investigation, administration, personnel matters, and emergency management. The most desirable candidates will have a track record of promoting transparency, community-oriented policing, collaborating with stakeholders, and building trust and comradery within a police organization. This position requires a Bachelor’s degree from an accredited college in police science, law enforcement, criminal justice, public administration or closely related field, and at least seven years of law enforcement experience with at least three years in a supervisory position equivalent to police sergeant or higher; or any equivalent combination of education, experience, and training. Additional job functions, duties and requirements are posted on the Town of Snowflake website at http://ci.snowflake.az.us/town-hall/employment-opportunities/ . Candidates are strongly encouraged to submit a compelling cover letter, résumé, and list of references to Mr. Brian Richards, Snowflake Town Manager, at 81 W. 1st Street S, Snowflake, AZ 85937, or by email to brian@ci.snowflake.az.us. The closing date for applications is Friday, April 19, 2019. The current salary range is $72,828 to $82,750 annually. Benefits include twelve paid holidays, vacation and sick leave accrual, health insurance, participation in the Arizona Public Safety Personnel Retirement System (or Arizona State Retirement System for those already retired through PSPRS), an annual uniform allowance of $1,150, and an annual individual training allowance of $2,000. Administer, plan and direct the operations of the Snowflake-Taylor Police Department functions to protect life and property through law enforcement and crime prevention activities for the Towns of Snowflake and Taylor. Develops and implements objectives, plans, programs, policies, activities, and operations for the Police Department. Provides technical support and recommendations to the Town Managers, Mayors, and Town Councils including the interpretation and application of policy and procedure and risk management best practices. Bachelor’s degree from an accredited college in police science, law enforcement, criminal justice, public administration or closely related field, and at least seven years of law enforcement experience with at least three years in a supervisory position equivalent to police sergeant or higher; or any equivalent combination of education, experience, and training. These requirements are in addition to the minimum requirements of Police Officer as established by Arizona P.O.S.T.